This superb recipe for roasted tomato and jalapeño chile soup with Gruyère croutons was created by Chef Ben Berryhill. For Soup Base: Preheat oven to 375ºF (190ºC). Roughly chop the red bell peppers, jalapeños, onions, carrots and garlic. Combine with fresh tomatoes and 1/2 cup cilantro leaves. If using canned tomatoes, set tomatoes aside for later. Coat vegetable mixture with olive oil and roast in a jelly roll baking pan until caramelized and tender, about 30 minutes. Cool. Remove tomato skins. If using canned tomatoes, dry well, halve and mix with vegetables. Purée vegetables in batches in a food processor, leaving some texture. Add purée to chicken broth. Heat to a boil and lower heat; simmer for 1/2 hour. Season with lime juice, salt and maple syrup. For Croutons: Preheat oven to 250ºF (120ºC).. Finely mince garlic and toasted oregano. Combine bread cubes, garlic and oregano with olive oil and melted butter. Toss until evenly coated. Slowly toast in the oven until crusty and crunchy, 30 minutes. Remove from oven, briefly cool and toss warm croutons with 1 cup of Gruyère cheese, pressing cheese into crouton sides. Cool. 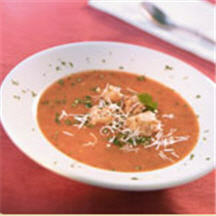 Serve hot soup with 3-cheese croutons in each of 6 large bowls. Sprinkle the reserved cilantro and Gruyère over the top. *To toast oregano: Heat a small, heavy skillet until hot. Add oregano and stir constantly with wooden spoon until aromatic. Be careful not to burn.